Glasswood have been involved in the window restoration of Truro Cathedral during the summer of 2017, a delightful project on a beautiful cathedral in the quint town of Truro. 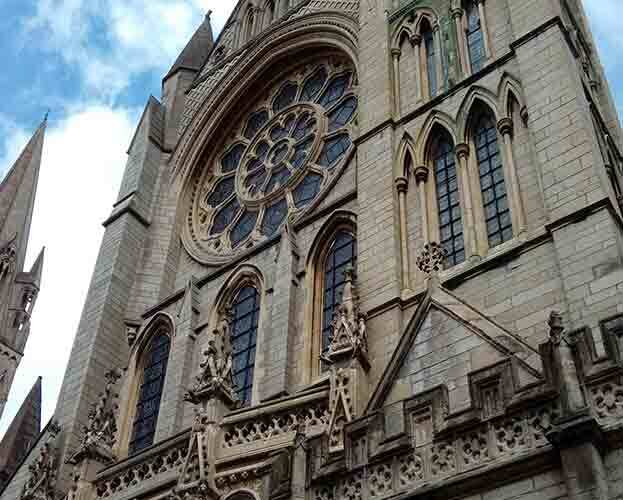 Truro Cathedral was built between 1880 and 1912, and incorporates part of a 12th-century church. This is the Dolcoath Mine Window in the Chapel of Unity, which was given to the cathedral by the Tregoning family. The image shows Cornish tin miners in an idealistic setting. Our work involved the removal of the feramenta bars that over the year have suffered with deep seated corrosion that has caused the stone to breakaway which is called spalling, the bars are about 12ft long and great care was taken removing them. The good news was the stained glass painted windows were in very good condition and could remain in place for many years to come, the only part of the window was the opening casement that had to be removed and taken back to the workshop to be restored, along with the ferramenta bars. By now it is abundantly clear that the window schemes in Truro Cathedral complement and develop the relationship between liturgical and architectural spaces, whilst each sequence of windows presents a multi-layered narrative on the profoundest theological themes. The recommended tour now moves to the baptistry area, where the iconography of the windows is a reflection on the themes of Baptism and of Christian Mission. The baptistry area in this chapter is defined as the baptistry itself and the adjoining Chapel of Saint Samson and Saint Boniface.198This Chapel was created in the 1930s from what was termed the baptistry vestibule by Pearson and Benson. This chapter shows how the glazing of these two areas must be treated as a whole, as it was originally intended by the architect and the Bishop. From 1887 to 1904, before the nave was completed, the main cathedral entrance was the south transept door. The baptistry vestibule therefore would have been reached by immediately turning left on entering the south transept door, up a flight of three steps, with a further set of steps leading directly from the vestibule to the baptistry proper. Today, the south porch door is rarely used, and the vestibule and the baptistry itself are entered from the south nave aisle. The subtle links between the iconography of the windows in the two areas, the liturgy of the baptismal service, and the spatial dimension of a progression through ever smaller and more intimate spaces has been lost for many decades. The 1930s reordering of the vestibule into a chapel effectively undermines all the original intentions of the architect and the visionaries behind the 1887 Master scheme for the windows. Saddest of all, the reordering destroys one of Benson’s most personal visions for his cathedral. Each of the lancets in the baptistry vestibule is divided vertically into three panels. It is obvious that something new for the themes for the baptistry windows was needed, as all the orthodox baptism iconography had already been used in the windows of the vestibule. Mason’s radical solution to the subject matter for the four windows of the cathedral baptistry is one of the most imaginative in the whole building. The baptistry windows continue the ideas of the vestibule in that they form a new version of typological juxtaposition of figural types from an earlier age with antetype events from a later age. However, it is not the customary Old and New Testament typology that Mason used in this baptistry, but a specifically Cornish set of references. This integration of Cornish Christianity with the general narratives of Church history will reappear more and more frequently in the later Church History sequences of the north quire, north transept and nave aisles. These Cornish themes for the baptistry were a major part of the 1887 Master Scheme, and can be viewed as Benson’s attempt to forge a distinct Cornish identity separate from that of the original Diocese of Exeter. What makes this subject so appropriate for the baptistry of Cornwall’s first cathedral for over nine hundred years is the manner in which the Martyn theme is linked to the Celtic missionary saints from Wales, Ireland and Brittany who originally established Christianity in Cornwall. One can sense Mason’s hope that each baptism in the baptistry would be the admission of a new member of the Christian church who might eventually be inspired by the earlier examples of mission portrayed in the windows.